Solo Checkfast laptop briefcase's lay-flat clamshell design separates your computer from accessories to meet Travel-Sentry® checkpoint-friendly requirements, allowing quick x-ray scanning. The exterior is made from 1680D Ballistic Polyester and interior is fully lined. 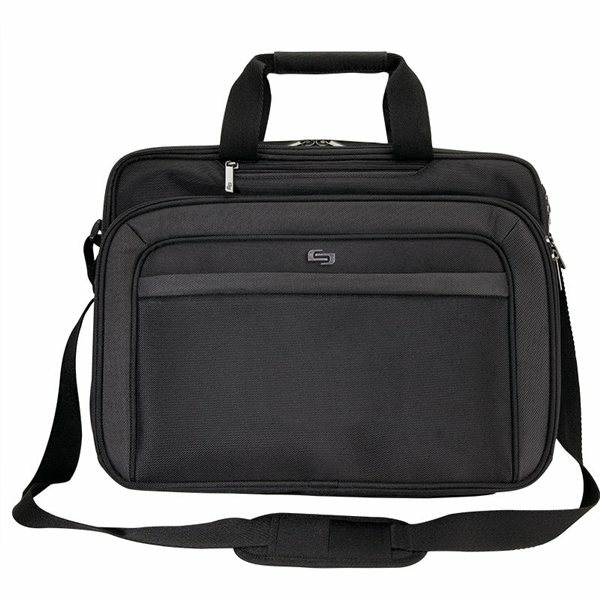 The padded main compartment holds laptops up to 17" and has interior pockets for standard and mini tablets. Second full size zippered divided compartment holds and organizes documents. Front zippered organizer pocket features a large interior pocket and accessory organizer pockets. Also includes a small zippered passport/wallet pocket and front zippered exterior compartment offers more storage. Also features carry handles, a 1 1/2" x 49" padded and adjustable shoulder strap and hook and loop trolley strap. Finish / Material: 1680D Poly, 600D Poly. Additional Stock may be available domestically. I feel this was a good value for the money. Every thing about my experience with AnyPromo has been great. Great printing. the customer service at AnyPromo is exceptional. I really had a very professional and delightful experience placing my order of the stop sign fans. Thank you. Ordering is very easy. Answer questions quickly and produce a great product. Imprinted with our company logo.